The University of Hawai’i basketball team had about 32 minutes of playoff-worthy game available on Thursday. 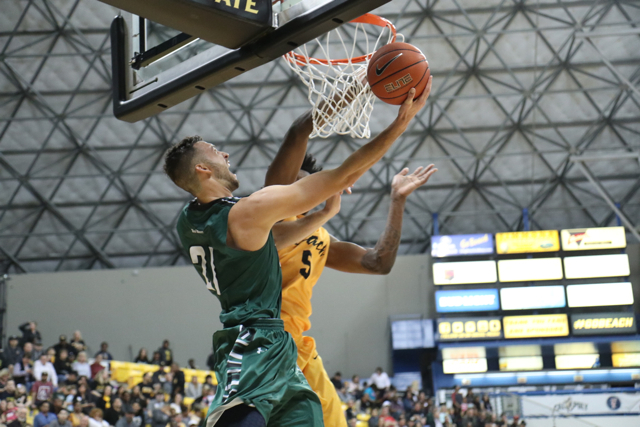 Unfortunately, the game lasted 40 minutes, and Long Beach State pulled away in the final eight minutes of a 73-62 victory over the Warriors in a quarterfinal game of the Big West Conference Tournament at the Honda Center in Anaheim, Calif. The Warriors, who were the No. 5 seed for the tournament, finish their season at 14-16 overall. The No. 4 seed 49ers improved to 15-18 and will advance to Friday’s semifinals against top seed UC Irvine. Noah Allen capped a brilliant senior season – his lone season at Hawai’i – with 21 points. Gibson Johnson added 18 points and six rebounds, and Sheriff Drammeh contributed nine points for the Warriors. Long Beach State shot 53.1 percent from the field, including a combined 11 for 11 shooting night from forwards Barry Ogalue (7 for 7) and Temidayo Yussuf (4 for 4). Hawai’i shot 38.3 percent from the field, and was also hurt at the free-throw line (11 for 21, 52.4 percent). The first half featured six lead changes and six ties. Hawai’i led by as many as six points (17-11 and 19-13) in the first half, but the 49ers went on a 10-2 surge to take a 23-21 lead with 6:05 remaining in the first half. A 3-pointer by Leland Green gave the lead back to the Warriors at 25-24. Hawai’i eventually took a 35-33 lead at halftime, with Allen (14) and Johnson (11) accounting for 25 of the points. Sophomore forward Jack Purchase, who suffered an ankle injury in the regular-season finale at Long Beach State five days earlier, was in the starting lineup but did not score in 12 minutes of action in the first half. He finished with two points on 1 for 6 shooting in 25 minutes. Long Beach out-scored Hawai’i 15-6 in the first five minutes of the second half to take a 48-41 advantage. The Warriors caught the 49ers again at 54 when Brocke Stepteau found Johnson driving to the basket for a layup with 9:08 remaining. The 49ers responded immediately with an 10-0 surge to take control for good at 64-54 with 4:51 left. Hawai’i never got closer than nine the rest of the way, and the 49ers stretched the lead in the final three minutes. Justin Bibbins scored a game-high 27 points for Long Beach, and Ogalue added 16 points. Yussuf finished with nine points and eight rebounds. In the last two games against Hawai’i, Yussuf shot 13 for 13 from the field. No. 2 UC Davis vs. No. 3 Cal State Fullerton, 9:00 p.m.
Ganot you gotta recruit or make room for D1 transfers. Next season Real Season One for Eran to get that 28-6 NCAA team. Need better guard and big players. BigWest athletes. Good effort by team. Overachieved this year..24 win season next year? Team gets better and better bench. I thought Warriors had chance to go NCAA again..Not enough horses.